The 1960s and 70s were a time of protest and change in America, and while marches and rallies were bringing the messages of dissent and disaffection to a world stage, movement activists were also using the marketplace to share and promote their ideas. 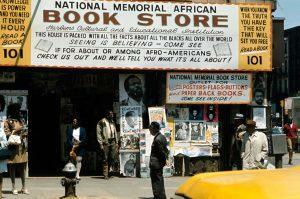 Their unique storefronts offered politically-conscious alternatives to conventional, profit-driven business models. Today we’re going to take a closer look at those radical shops -- why many failed, some succeeded, and what impact they had on their movements. Joining guest host Rob Sivak in the studio is Joshua Clark Davis, an assistant professor of history at the University of Baltimore and the author of a fascinating new book, From Head Shops to Whole Foods: the Rise and Fall of Activist Entrepreneurs, which chronicles the struggles, successes and legacies of those pioneering storefronts. Later in the hour, Darius Wilmore joins the conversation to share his unique perspective on activist enterprise. Wilmore is a Baltimore-based design artist who’s produced the award-inning barber-shop style social commentary show, Fades and Fellowship, as well as the monthly storytelling series, The Short Cutz Show, rooted in the African-American and civil rights experience. As a self-described “social impact designer” who got his start with the legendary Def Jam rap music studio 20 years ago, he has been closely involved for the past decade in the creation and evolution of a successful Baltimore business called Taharka Brothers Ice Cream, a company that has used its products, and its profits, to support programs for young African American men in Baltimore. Prof. Joshua Clark Davis will be talking about his book as part of the Enoch Pratt Free Library’s Writers Live series, this coming Tuesday, March 13th, at 6:30pm, at the Maryland State Library for the Blind & Physically Handicapped (LBPH) @ 415 Park Ave, here in Baltimore. Darius Wilmore is also collaborating with Dr. LaMarr D. Shields and filmmaker Alex James on a live storytelling and multi-media experience called “#wherewereyou (when King was cut down)" that brings together people’s recollections of the day that the Rev. Martin Luther King, Jr., was assassinated 50 years ago this April 4th. The interactive project will be presented at the Reginald F. Lewis Museum on Wednesday, April 4th at 6:30pm. For more details, click here.